International Horticultural Exposition for His Majesty The King. One of the most beautiful shows in Thailand. It is available both day and night time. The park contains many mountains of different series and heights. Twilight Zoo Chiangmai Zoo is opened for every visitor to come to see many kinds of animal in the day time. The park made up of a series of mountains along the range known as Thanontongchai which runs North-South. This range is part of the great Himalaya range which originates in Nepal. The highest of the park is 2,565 meter, which is the highest point of Thailand. The park contains many mountains of different series and heights. When one view from the surrounding plains the range looks like a series of rising and falling waves. Throughout the park, different altitudes make plant and animal species diversity. From the foothills of the range, people can see the almost perpetual fog which covers the mountain�s top all year around. At the top of the mountain within the fog, visitors can see the moisture and dew that the fog provides the evergreen forest. 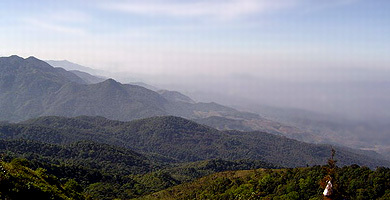 According to a cabinet meeting in 1972, Doi Inthanon National Park is one of the first 14 national parks established because of their high diversity of vegetation designed for conversation and recreation purposes. It is located at 31 km. of Chomthong-Inthanon Rd., Tambol Banlang, Chomthong District, Chiangmai 50160. Please contact us at the above address or at Tel.0-533-166-08 during the office hours: weekdays between 08.30a.m.- 4.30 p.m.